If there were a top ten of quotes that capture the essence of what innovation is about – the human spirit pushing boundaries – this would definitely feature as one of my favorites. It captures the mentality – the shared attitude, mind-set, way of working, and way of thinking – that unites people in innovative organizations. Those of you who have led teams will know how hard it is to get people to understand and buy-in to the most rudimentary game plan. In Disney’s case, this quote was evidence of organisational vision operating at a whole different level completely. Disney had created a believer who not only understood his vision, but also more significantly, cared enough to own it and then articulate the philosophy in a richly authentic and personal way. And therein lies the powerful connection between vision and innovation. The effectiveness of Disney’s vision and its clear impact on this employee really clarified (for me) the part that vision has to play in shaping, nurturing and embedding a corporate mentality (and, by association, its culture). In this case leading the way to a flourishing environment of innovation and creativity – a place where innovation was everybody’s business, no matter who they were in the organization. The answer lies where and how this quote was born – from an employee working on a major new customer experience. (the Horizons ride at Epcot) The ride was highly innovative at the time, using groundbreaking technology to create a market-leading theme park that brought magical experiences to the visitor. There was nothing like it at the time; the people working on this new experience were thinking like Disney and everything they thought and did paints a vivid picture of employees living and breathing innovation in complete alignment with the business priorities. Looking back at the Horizons project team, I bet there wasn’t a single nametag or project-name containing the ‘innovation’ moniker. Innovation was simply part of the corporate mentality and DNA – the way they did things and the way they thought. It was a mentality nurtured from a philosophy so deeply ingrained that the employees naturally reproduced (and arguably enhanced) Disney’s original thinking. They brought it to life in a way that connected the Walt Disney vision to a business reality that placed the customer at the center and generated strong profits. Is this not ultimately what innovation is all about? Employee thinking was hard wired to Walt Disney’s vision and the vision brought innovation to life as part of the daily zeitgeist. Innovation wasn’t regarded as an appliance – to be plugged-in, switched on and hey presto, it just happened! It was interwoven into Disney’s identity and core purpose – informing, directing and shaping everything that they did. Innovation was simply part of daily life, part of the mental attitude that defined the behavior of every Disney employee. Peter Drucker, a renowned management thinker, describes innovation as “the specific instrument of entrepreneurship… the act that endows resources with new capacity to create wealth.” For some, innovation can mean optimizing the potential benefits within a new idea, the idea could be exceptionally creative or already exist but can be improved into a new big thing. Steve Jobs was a master at improving existing ideas when he repurposed the technology sat gathering dust in PARC – Xerox’ research lab. I wholly subscribe to Drucker’s thinking. However, what stands out with this and other mainstream thinking on innovation is the all-too-often absence of humanity. In other words, the primal emotions that drive innovation and creativity, such as curiosity, thirst for knowledge, understanding …and the desire for meaning. Also, let’s not forget the importance of emotional connection to the consumer. If emotion is indeed a key element to achieving innovation, I find it curious how often the humanity bit is missed. To create a real culture of innovation, organizations need to create an environment that enables innovation and creativity to first exist and then flourish. 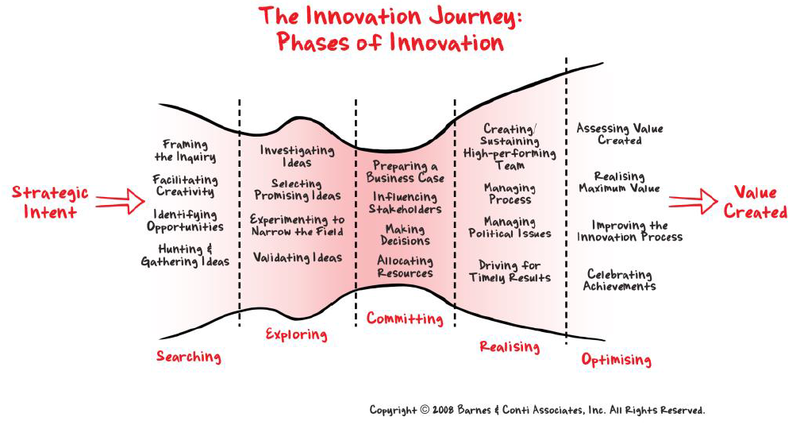 All innovation activity needs to be purpose-driven, both understanding and connecting with the business reality. Ultimately, organizations are here to serve the customer and to build a healthy sustainable business; innovation must be wired to this end… to creating value. Innovation cannot be treated as a standalone project, plugged in like an appliance, turned-on by the flick of a switch with minimal sponsorship, championing, role-modeling, resourcing and general thought and effort invested. If you’re lucky enough to have a Chief Innovation Officer or similar role within your organization, they need to be mandated with a clear and aligned purpose, as well as backed, empowered and resourced. They cannot fire-up the organization on their own. Is There An Innovation Mentality Where You Work? The vision needs to articulate the role of innovation encompassing all aspects of work. 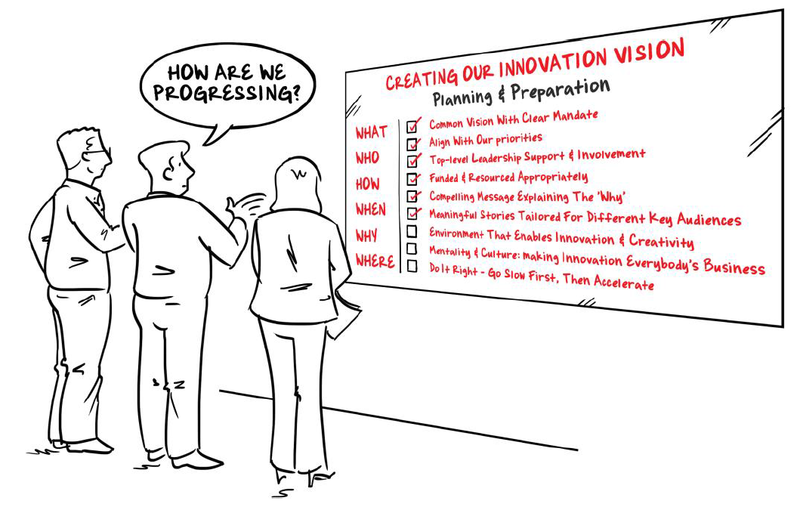 The innovation strategy should both align-to and integrate-with the business priorities. All employees (from the board down to the front-line) need to understand what innovation means to the organization in a clear and unambiguous way… this means getting rid of technical jargon and management speak! The leadership needs to create and actively promote an innovative and collaborative environment. This is about creating the right context (for your organization) that encourages and supports innovation, so that everyone is willing and able to innovate.